Herringbone that is. 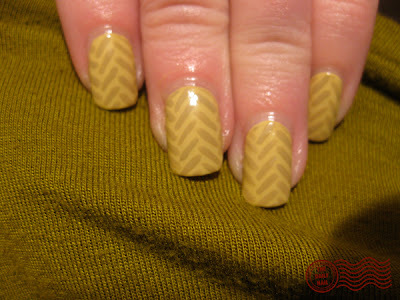 Today's nail art is my interpretation of a herringbone pattern. I actually even frankened the base polish myself- it matches the wall pant of someone I know perfectly! I loved the color so much on the wall (I picked it out, natch) that I had to create a nail polish for my very own. :) I used a mixture of equal parts American Apparel Manila, American Apparel California, and a few drops of L.A. Girl Army Green. I used my franked polish, which I'm still undecided on calling, with MAC In the Buff to paint the lines to make the pattern. Topped it all off with 2 coats of Seche Vite top coat. Congrats on the new job! Always pack a sweater or two. Way to go on the new job, look forward to tomorrows nails! Congrats on getting a job! Congrats on the job, so pleased you found something in your field. Congratulations on the new job. Interesting interpretation on the herringbone pattern I like it. I'm looking at your blog for the first time and am enjoying ..
from today I will follow him. My congratulations you have a lot of creativity. Congratulations again!!!! You are so fabulously creative, we knew any company worth it's salt would hire you!!!! And, your franken is a gorgeous color- looks like the harvest moon did here in the midwest a couple of days ago. In the early evening it was really large and golden (your franken color)- due in part to the sunset and the Autumnal Equinox. Then it got really bright and blue-white as the night progressed. Any name possibilities there, or is this too geeky? You could do your nails on that day in tribute to Brazil? I'm sorry if there is any mistake in writing because I am using the google translator.